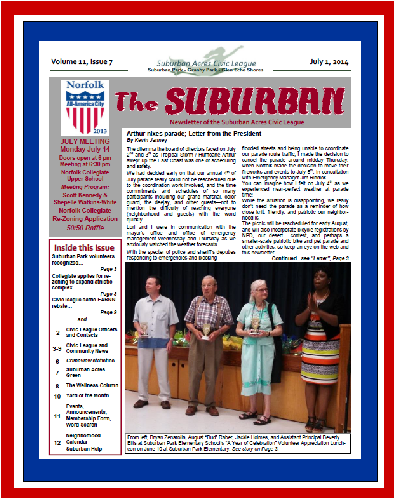 Yes, there was a hiatus due to unforeseen circumstances, but it is back…here is the June-July 2016 edition of The Suburban, the newsletter of the Suburban Acres Civic League. All the news that is news for Suburban Park, Suburban Acres, and surrounding Wards Corner area plus neighborhood and community news and events. Enjoy! The March 2015 issue of The Suburban is here in color, and on the way to your door! Please join us Monday evening March 9th for our monthly meeting. Doors open at 6 pm for refreshments; the meeting starts at 6:30 pm. There’s lots of good news about our neighbors in the December edition of The Suburban! High-energy Parent-Teacher Liaison Claudette Dalmida (Suburban Park Elementary) was also featured in The Pilot this month, and we have the highlights and photos in this month’s Suburban. SACL officers and board members to be elected in December, information on the Annual “Year in Review” and Holiday Party on December 8th, CrimeView stats, Neighborhood Watch Report, Suburban Acres Green, and more neighborhood and Wards Corner area news are in the December edition. Please join us Monday evening October 13 for Suburban Acres Civic League general business meeting at Suburban Park Elementary School. Doors open at 6 pm, the meeting starts at 6:30 pm. Special refreshments this month with our fall-themed Crock Pot Cook-off, with prizes for the best crock pot cookery! Our guest speaker is Suzanne Patrick, Democratic nominee for the 2nd Congressional District election on November 4th. Plus CrimeView crime status, Suburban Acres Green, Dr. Brad’s Wellness Column, and more neighborhood news and announcements. Suburban Acres Green, CrimeView Stats, news, announcements, neighborhood calendar, and more! Our meeting this month…Monday evening September 8th…we are back at Suburban Park Elementary. Doors open at 6 pm for refreshments, and the meeting begins at 6:30 pm. Our special guest is Fenton Priest from Eggleston Services. Mr. Priest will speak about Eggleston Service’s many retail operations that support employment of handicapped persons in Hampton Roads, and a new program at Eggleston’s Tanner’s Creek Garden Center that features plants used in wetland restoration. Announcements, Neighborhood Watch report & CrimeView statistics, and more!